Here you’ll find two different methods for breaking down a rabbit fryer. First is a video guide featuring seam butchery techniques presented by an expert butcher. Below that is a text & photo guide by one of our chefs. 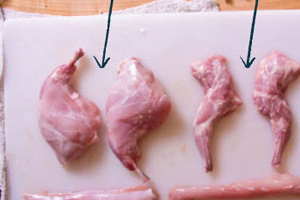 Cutting up (“fabricating”) a whole rabbit is similar to cutting up poultry in terms of the basic technique, even though the anatomy is rather different. By following the below steps you’ll be able to easily separate a whole rabbit fryer into two back legs, two loins, and (if desired) two front legs. 2. Take hold of a back leg, and cut where the leg meets the loin, peeling away the meat with your hand to expose the joint. Cut all the way down to the back bone. Pull the leg back towards the spine to crack open the joint, and cut through the resulting gap with your knife. Make whatever other minor cuts that are necessary to completely separate the leg. 3. Repeat with the remaining back leg to remove it. 4. To remove the loins from the saddle, turn the rabbit so that its back is up, and feel the loin muscles that run along the spine on either side. Cut along the spine, making a small incision with the point of your knife and running the tip along the resulting gap, going a little deeper each time. 5. Follow the bone structure, continuing to scrape with the point, peeling the loin muscle away from the spine with your other hand as you work your way down. 6. Make whatever small cuts (straight down) that are necessary at the shoulder and back end to finish separating the loin. 7. Repeat with the loin on the other side of the spine. 8. If desired remove the front legs using the same method as the back legs (you don’t need to crack the joint if you don’t want to, depending on the shape of the leg you want…we didn’t). 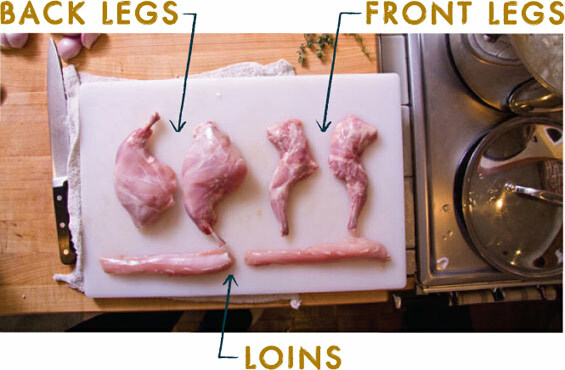 For ideas for what to do with the rabbit legs and loins once you’ve separated them, check out our rabbit recipes. The spine and front legs can be used to make rabbit stock (using the method for white or brown veal stock). I’ve started raising rabbits for meat (home consumption) and open to tips and information. You’ll find all our rabbit content here: rabbit recipes & tips. Thank you very much for this! It came in handy for my first rabbit recipe. Thanks for letting us know John. We’re glad it helped!